Keep cool and snack healthy with this Persian Yogurt and Spinach Dip (Borani-e Esfenaj). Summer appetizers are a real treat. You have a wide assortment of produce you can choose from to make it something special. This appetizer doesn’t use seasonal ingredients, but because it is made with yogurt and is served cold, it really is refreshing to serve on a hot summer day. 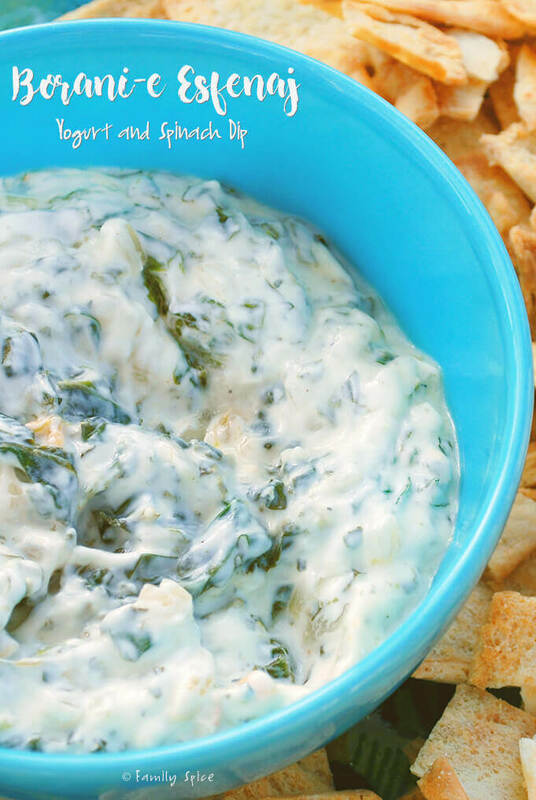 This is an easy Persian appetizer, Yogurt and Spinach Dip (Borani-e Esfenaj). 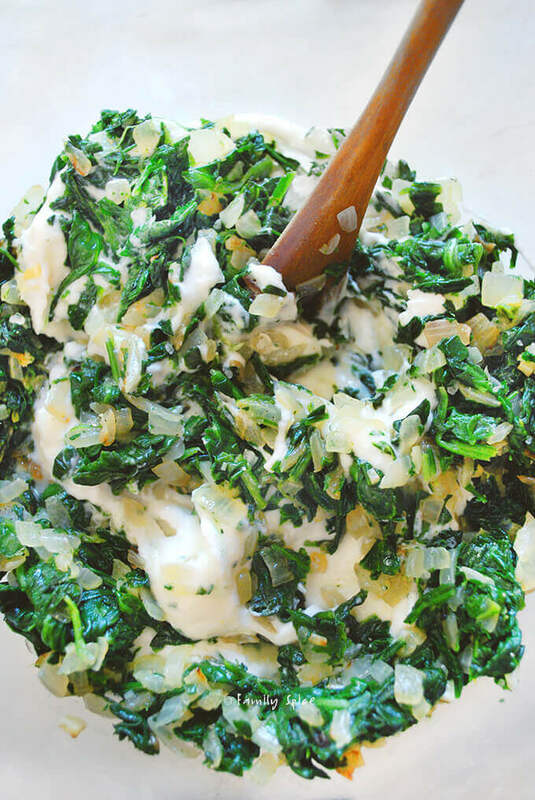 You sauté your onions and add garlic and chopped spinach, cook for a few minutes, and then let cool. 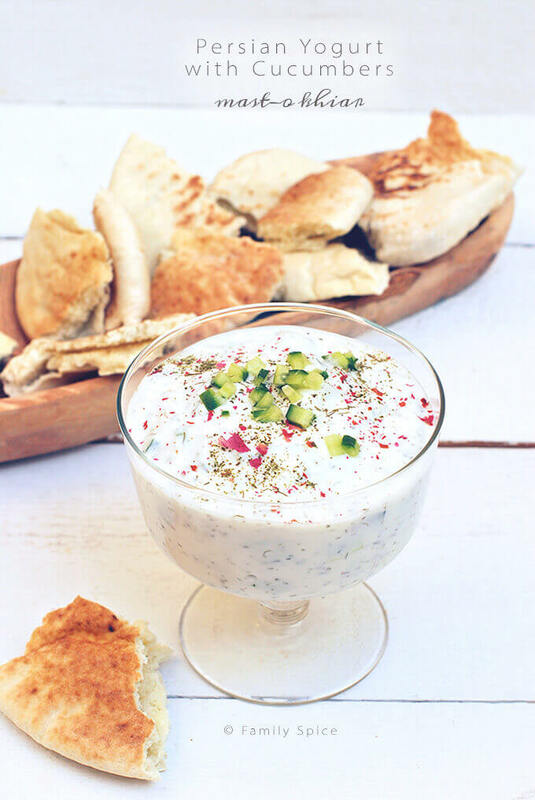 Stir in your yogurt, the thick sour Middle-Eastern yogurt and let it sit in the fridge for the flavors to blend. I made took this to my friend’s house for a pool/dinner date and we were all munching away. Of course, the pita chips don’t hurt either! 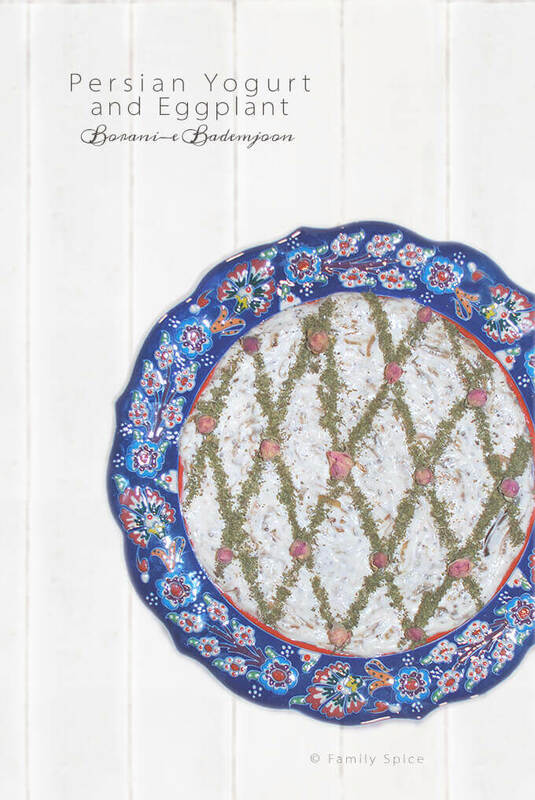 Another great yogurt appetizer is Yogurt and Eggplant Dip (Borani-e Bademjoon). This recipe is lighter than the traditional recipe because I roast the eggplants in the oven, instead of pan-frying. And my final Persian yogurt appetizer is Persian Yogurt with Cucumbers (Mast-o Khiar). No cooking involved with this one! Simply mix chopped cucumbers with dill, mint and yogurt. You can also add walnuts and raisins to it. This is especially popular with the kidlets. All of these recipes can be used as an appetizer or a side dish. When onions start to soften, reduce heat to medium-low and cook until onions brown slightly, about 7 minutes. Cook for 5 minutes, or until spinach is wilted and cooked. Mix until combined, cover and refrigerate for 2 hours prior to serving.